About Dover: Dover lies in the thriving and scenic Seacoast region of New Hampshire. Founded in 1623, Dover holds the distinction of being the oldest continuous settlement in New Hampshire, as well as the 7th oldest nationally. 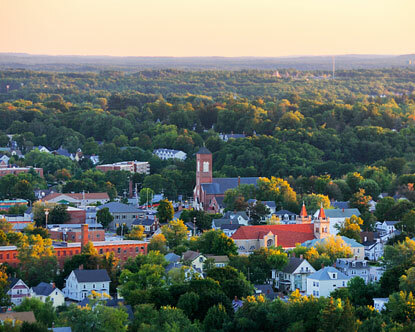 Today, Dover is the largest city in the Seacoast region, with just under 30,000 inhabitants. Dover provides a very picturesque location between the mountains and the Atlantic Ocean, while also being minutes away from Portsmouth, NH, and roughly an hour away from larger cities such as Portland, ME and Boston, MA. Dover Attractions: Although Dover maintains a small-town feel, there are many things to see and do in the city. The beaches of the Atlantic Ocean are within a half-hour drive,and many great hiking opportunities are plentiful. Dover has a wide range of museums for all ages, including the Children’s Museum of New Hampshire, which provides plenty of hands-on learning experiences for children of any age. Dover’s local Recreation Department also provides many outdoor opportunities, such as an indoor and outdoor pool,walking and biking trails, and dozens of parks and green areas.